Week 96 and only a little late in being published! I delved with relish into Mary Berry’s Baking Bible having been inspired by The Great British Bake Off‘s doughnut episode. 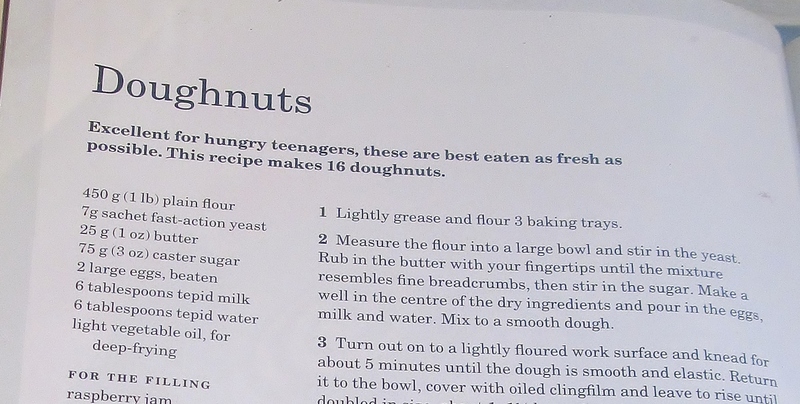 In the children’s section of the bible, there is a recipe for Mary’s basic doughnuts which I was happy to begin with and found the Austrian tart recipe as my second bake. I set off by making the dough for the doughnuts, as it contains yeast, I had to then leave it to prove for quite a long while. Luckily my kitchen was warm and it rose as it should. Mary then asks you to knock it back and knead it again. 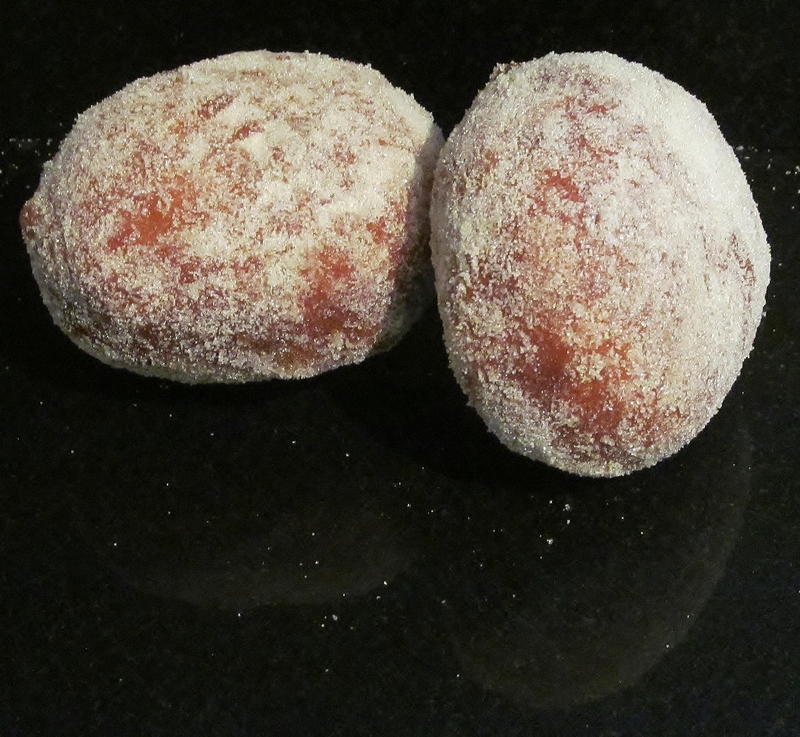 Then divide the dough into approximately 16 balls and – this was the weird part- add a spoon of strawberry jam to the centre of each ball and fold in and then leave to prove again. Finally after the last prove, you are asked to deep fry them- this had posed a question, I do not own a deep fat fryer and didn’t want to buy one just to complete this challenge so I bought a basket and used one of my saucepans. this worked well but you can’t control the temperature of the fat as accurately as a fryer. I fried my doughnuts two at a time and then rolled them in the sugar/cinnamon mix and left them to cool. I then sent a food parcel to my chief tasters and we delved into the rest! For my first foray into doughnuts, I didn’t think they were too bad! The second recipe, the Austrian apricot and almond tart involved making Mary’s pastry first and then rolling it out to fit in my flan tin. 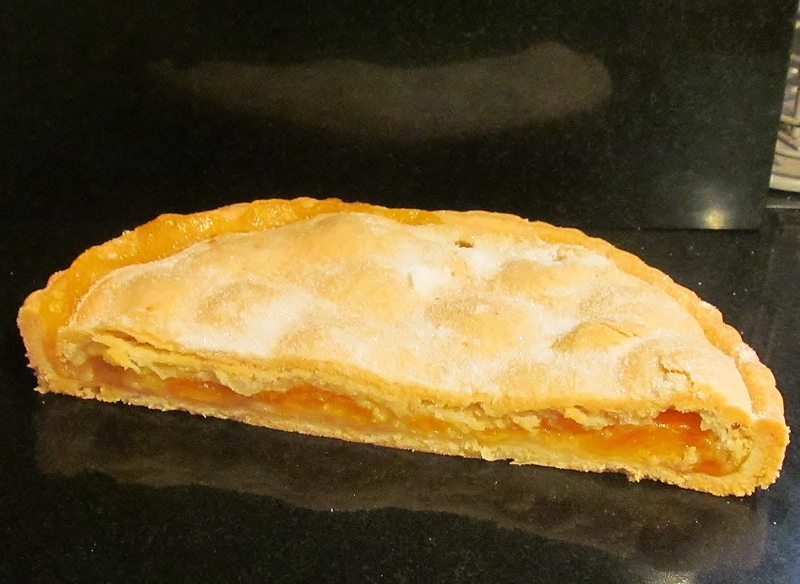 I grated the marzipan and put this in the pastry case first followed by halved apricots. Mary doesn’t really tell you how to lay these in but I made circles of them. Finally you have to roll out a circle of pastry for the top and press it down and it creates a landscape of rolling hills with the apricots. the last step was to put it in the oven. 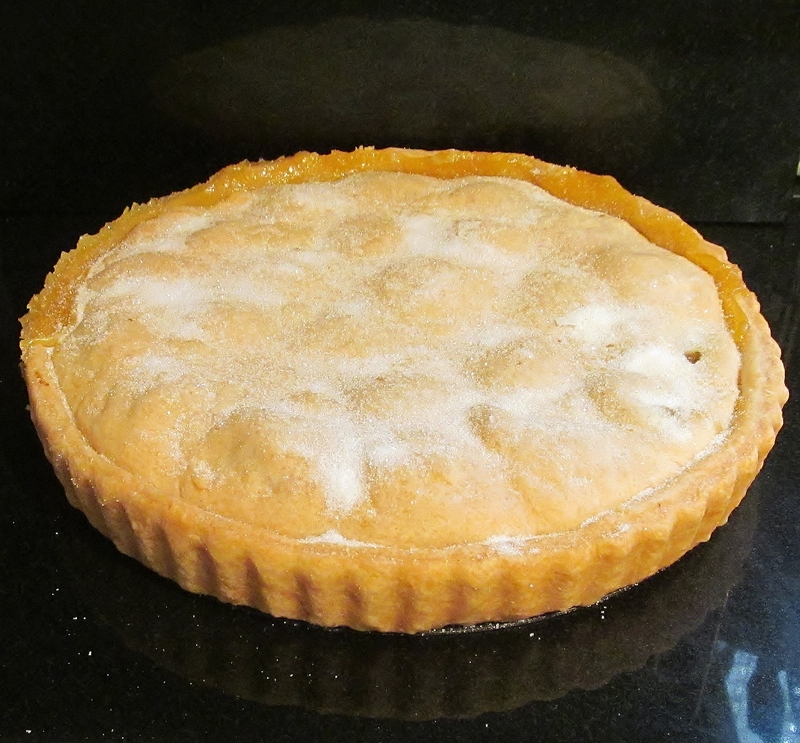 I had to bake the tart for a little longer than Mary suggested but it was definitely worth it, I had a tart that was very tasty – the apricots and melted marzipan flavours definitely complimented each other and there wasn’t a soggy bottom in sight! The Bake Off has nearly reached it’s conclusion now- the final is this week- I would now like Richard to win but am looking forward to the episode with bated breath! This entry was posted in Kim's cake challenge and tagged almonds, Baking Bible, Cook, Cooking, doughnuts, Great British Bake-Off, Kim's Cake Challenge, Mary Berry, Mary Berry's Austrian Apricot & Almond Tart, Mary Berry's Baking Bible, Mary Berry's Doughnuts, sugar, yeast by kimsideas. Bookmark the permalink.